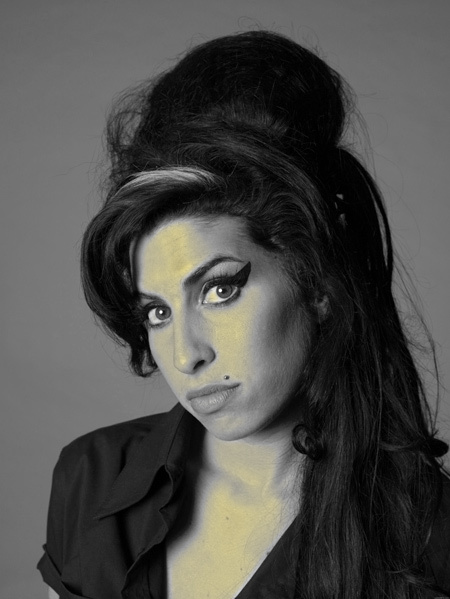 Amy Winehouse didn’t look like you or me. She didn’t play to type with that throwback beehive and ‘I’m scary’ eyeshadow, a faux diva that you wouldn’t stand next to at a party. She was that glorious one-of-a-kind singer that seemingly came out of nowhere. We cheered her frank defiance, it appealed to our inner rebel, tilting against higher authority figures, drowning out the drone of parental righteousness. Five Grammys and many other awards later, at 23, Amy was on a bullet train to infamy and we all knew it. Sudden fame is such a destructive force and we’ve seen this telemovie before. Stuck on a treadmill of troubled performances, between alcohol and drug binges, spiralling in and out of control on an endless loop, fuelled by Jay-Zish remixes, can the singer separate herself from that song when concert-goers scream for another encore of you-know-what. Were we all partly to blame, then? When we want a piece of that glitter called fame and it shatters before us, do we just fade to black, walk away, find the next, new shiny thing? Or do we ask ourselves why we, as a society, cannot intervene when we can see the descent and destruction and the solution that is oh-so-obvious. When a man in Oslo, Norway wakes up one day and decides to shatter the lives of everyone around him, we lament that it could not be predicted. It is McVeigh, Mohamed Atta, the Unabomber, Virginia Tech’s Cho Seung-Hui and the Columbine killers all over again. Loners, isolated from the mainstream, invisible not only to us but even to those closest to them. Or perhaps, ignored out of our sheer helplessness. But when we see the stars dying before us, does it suffice for us to just sit back and watch them flame out? Are their lives as worthless as an iTune download, lost in the shuffle? As flippant as a retweet: R.I.P Amy Winehouse? When I awoke that morning and informed my daughter of Amy’s loss, her instant comeback was that Lindsay Lohan was next. Precocious cynicism, or just simple predictable truths as seen through a 12-year-old? We don’t need to be prophets of doom to see the unravelling of a life before us. “I’ve known for a long time that my daughter has problems. But seeing it on screen rammed it home. I realise my daughter could be dead within the year. We’re watching her kill herself, slowly. I’ve already come to terms with her dead. I’ve steeled myself to ask her what ground she wants to be buried in, which cemetery. Because the drugs will get her if she stays on this road. I look at Heath Ledger and Britney. She’s on their path. It’s like watching a car crash – this person throwing all these gifts away,” Janis, Amy’s mother in a 2008 interview. Well, who’s next? Should we take a poll and vote on it? Will this crowdsourced list help us then alleviate the obvious? Will we able to intervene where others can’t?